If a tree falls in the forest and there are no enzymes to digest it, does it break down? It's a question that has important ramifications for the renewable energy industry. Engineers are studying methods to transform non-food plant material into transportation fuel. Think alfalfa stalks or wood-chips (which have energy contained in a molecule humans can't digest called cellulose), as opposed to the edible corn grains that are used in the production of ethanol for biofuels. "Cellulose in the biosphere can last for years," said Gregg Beckham, a scientist in the National Bioenergy Center at the U.S. Department of Energy's National Renewable Energy Laboratory. 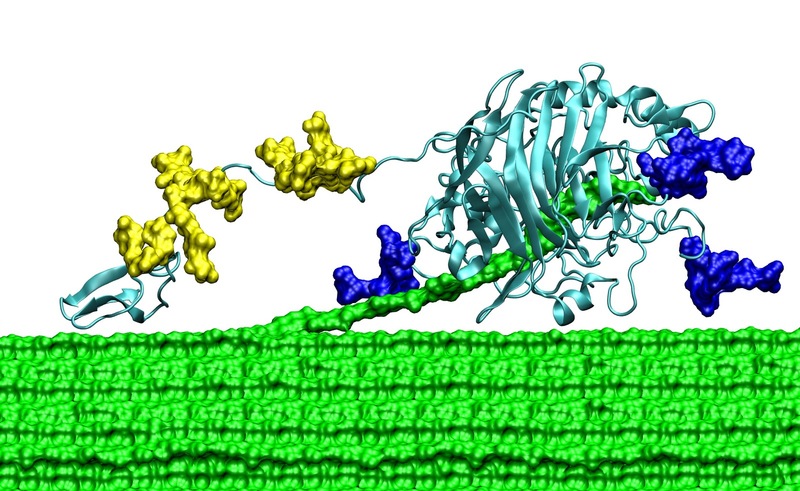 "It's really tough, and we want to know why at the molecular scale." Despite the strength of plant cell walls made of this tough molecule cellulose, over eons, fungi and bacteria have evolved enzymes to convert abundant cellulosic plant matter into sugars to use as an energy source to sustain life. Unfortunately, these particular enzymes don't work fast enough to break down cellulose at a pace (and price) that is competitive with fossil fuels … yet. So, computational scientists at National Renewable Energy Laboratory set about trying to understand and create enhanced, "designer" enzymes to speed up biofuel production and lower the cost of biomass-derived fuel to serve the global population. "It's a Goldilocks problem," Beckham said. "The enzymes have to be 'just right,' and we're trying to find out what 'just right' is, why, and how to make mutations to the enzymes to make them most efficient."